This is a simple program for you to copy and adapt. It is based on the game that is sometimes called Mad Libs. People contribute random words to a story. I started off by thinking of the story I wanted to make so I knew what pieces of information to get from the user. Peter Parker was bitten by a radioactive spider and turned into Spiderman. The words that are shown in bold text will be chosen by the user. The smaller text boxes are called (from the top) txtName, txtAnimal, txtInjury, txtSuperName. The labels on the right are called (from the top) lblName, lblAnimal, lblInjury, lblSuperName. The button is called btnMakeStory. 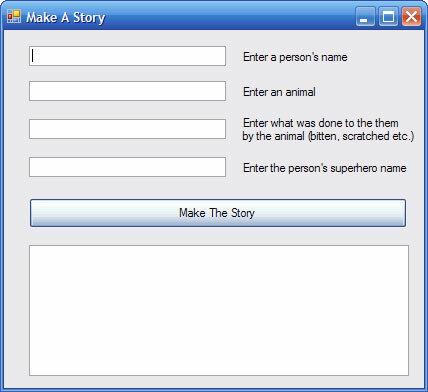 The larger text box is called txtStory and has the multiline and wordwrap properties set to true. Create a new project and save it to a new folder in your user area. Create the form as detailed above. Double click on the button and type the following code in to the button's click event handler. strStory = strName & " was " & strInjury & " by a radioactive " & strAnimal & " and turned into " & strSuperName & "." Save your work and test that the program works. Before you take on this challenge, make sure that you understand every line of code. Print out the code and annotate your printout to explain the purpose of each of these lines. Start by writing your story. Remember, the point of this program is to produce a funny story because the user doesn't know what they are going to end up with. Try to make it so that there are at least 10 things that the user has to contribute.